For almost fifteen years the Deutsche Bahn subsidiary DB Rent is active in the bicycle rental business and currently owns some 13,000 bicycles in 50 cities according to the leading provider in Germany. The capital of Berlin is, of course, not missing, which is an important market with around 3.5 million inhabitants and countless tourists. However, the Senate had terminated the contract for the bike-sharing offer at the end of 2016 and asked DB Rent to dismantle its own stations. In future, the capital will cooperate with the Leipzig company Nextbike. The Deutsche Bahn subsidiary does not give up however and starts on 5 March 2017 together with the discounter Lidl a new bicycle rental business - without subsidies from the Land Berlin. 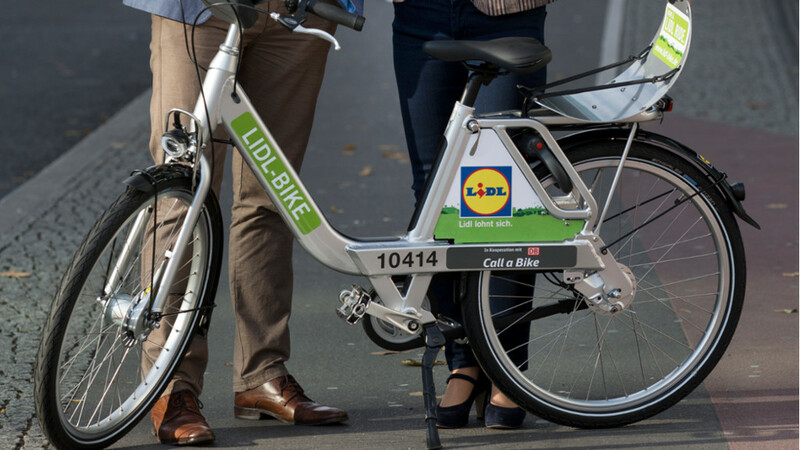 The new bike rental business is on the name of Lidl Bike and, with its 3,500 silver-squeaky wheels, DB Rent is a fleet that is more than twice as big as the "Call a Bike" offer last year. As the name suggests, the discounter is the sponsor and name of the new bicycle rental system. DB Rent, on the other hand, assumes the role of the system operator and looks after the customers. In the basic tariff Lidl Bike costs 1 Euro every 30 minutes, when the customer uses one of the 353 return zones. In the comfort tariff for 9 euros monthly or 49 euros annually, the first half hour is even free. The 88 square kilometer area covers the area within the Berlin S-Bahn ring road. Particularly pleasing to the users: All customers of "Call a Bike" as well as the bicycle rental systems with other cooperation partners can access Lidl-Bike without a separate registration. Customers of Lidl-Bike are also the entire "Call a Bike" offer in Germany without any further registration available. While consumers are likely to be happy about the new market conditions, DB-Rent competitor Nextbike is likely to be less of a hit. Finally, the company is " tied to quality criteria dictated by the country" according to the day-to-day level. At Lidl Bike, however, such requirements are not possible because there is no contract and no without subsidies from the Land Berlin. A Nextbike spokeswoman accuses Deutsche Bahn of using unfair means.